As Valentines Day approaches, now is the time to plan that romantic weekend away with your loved one. According to a recent survey conducted by American Express, more and more people are now arranging engagement vacations where lovers pledge their troth and ask for hands in marriage. One of the universal methods of displaying love, alongside carving your names on a tree, is to fix a padlock with your names inscribed on, in a public space. The practice has now been adopted at locations all over the world, so where are the best locations to take your loved one to seal your fate. 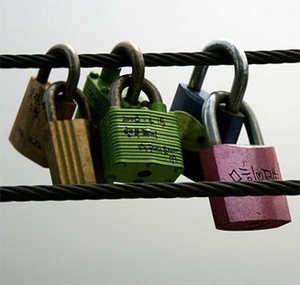 It is believed that the practice of love padlocks was started in China where lovers would fix locks to the chain link fences of the Great Wall and then throw away the key. The view over looking Mount Huang has become one of the most famous of the padlock sites with sweethearts throwing the keys into the deep gorge below. At the centre of Florence’s romantic, Ponte Vecchio, lovers attach padlocks around the statue of Benvenuto Cellini. It is said that the novel by Federico Moccia “Ho Voglio di te” (I want you) was responsible for starting the Italian tradition. Lovers copied a passage from the book where main characters seal their love on the Ponte Milvio in Rome, which has become another popular spot. The self-proclaimed city of lovers has sites at the Pont des Arts across the Seine and the Passerelle-Leopald-Sedar-Senghor Bridge where lovers proclaim their love. Earlier in 2010 the council who had declared them an eyesore removed more than 2,000 padlocks from the Pont des Arts. That was not going to stop the display of affection and once more padlocks are adorning the sides of the bohemian bridge. Across the span of the Luzhov Bridge in Moscow you will find the love trees, it is here that courting couples attach their loving padlocks. Instead of cutting the locks from the bridge and destroying them the Russian Authorities erected the love trees so that the tradition could continue. A small pedestrian footbridge across a stream that flows into the river Vltava is the focus for lovers of Prague. This little bridge with a view of an old waterwheel is around the corner from the famous Lennon Wall and has increasingly attracted couples to padlock their love to the railings. The tradition is credited with being the inspiration of Glen Emery the former owner of Prague’s Jo’s Bar and a driving force in the city’s avant-garde scene. This entry was posted in Top Tips, Travel and tagged courtship, love, love customs, love locks, love padlocks, Romance, valentines day. Bookmark the permalink. 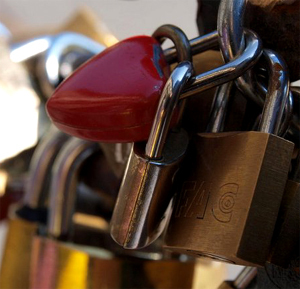 The coolest place to “lock your love” is NOW at Zion Canyon Village, Springdale, Utah. Just outside the Zion National Park entrance. There is a beautiful “Lovescape” waiting for all the lovelocks to show up. There is a “Lovescape” on Main Street, St. George, Utah, also. Check them out!